Originally published on February 5, 2012. It’s game time and we’re ready to celebrate with all of you by offering a very special Super Bo—uh—Superb Owl episode! We’ve got our Taquitos, Pace Picante Sauce and Stella Artois and we’re ready to talk about the best (and not so best) books of the last two weeks! While we’re not doing a news segment this week, of course we had to discuss the brouhaha over Before Watchmen. This episode is perfect for your tailgating! 00:08:34 Don and Jerry offer their thoughts on Before Watchmen. 00:19:46 Winter Soldier #1 Don and Jerry enjoy this new Ed Brubaker title—but Butch Guice and Bettie Breitweiser steel the show. 00:25:05 I, Vampire #5: There’s nothing but love for Joshua Hale Fialkov and Andrea Sorrentino’s vampire series. 00:29:21 The Sixth Gun #18: We’re happy to see another great jumping on point for Cullen Bunn’s fun Western tale. 00:34:17 Justice League #5: The unmasking sat well with us. 00:42:33 All Star Western #5: DC has a new odd couple in our second Western title of the week. 00:48:40 Ultimate Comics Ultimates #6: We’re digging this book, but spend some time discussing Mark Millar’s original series. 01:28:39 Secret Avengers #21.1: Don knew how Jerry would feel about this book. 01:37:34 Flash #5: We’re totally sold on Francis Manapul and Brian Buccellato’s Flash run. 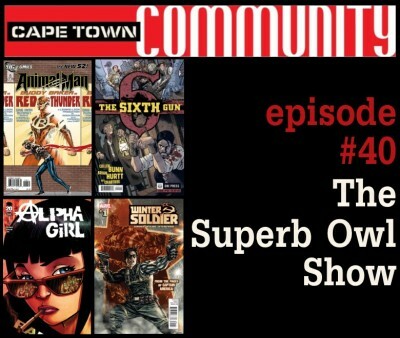 01:41:45 Alpha Girl #1: There was little to enjoy in this uninspired zombie book. 01:46:23 Defenders #3: Don and Jerry disagree on the direction of this series. 01:50:10 Animal Man #6: An example of the best of DC’s New 52. 01:55:49 Hawk and Dove #6: Okay, so we learn Don is an angry drunk.